* According to footyghana.com, controversial playmaker Bernard Don-Bortey (born 22.09.1982) has travelled to Vietnam and top club Song Lam Nghe An. * Asante Kotoko FC lost their teenage left-back Abdul Rahman Baba (born 02.07.1994) to SpVgg Greuther Fürth in the German Bundesliga. According to MTN Football, Baba has been replaced by Ivorian defender Ben Adama Banh of Africa Sports in the Ivory Coast. Banh is a versatile player who can play anywhere in defence, although he seems to prefer the left-back. 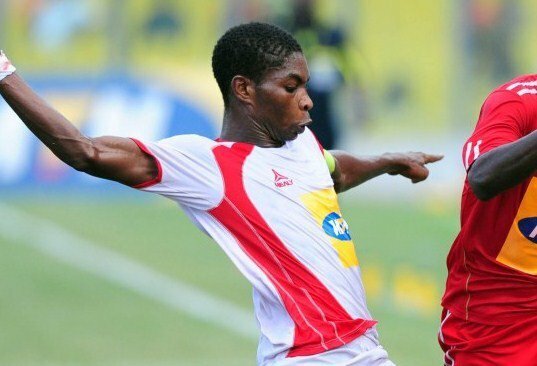 * Kotoko will miss the services of powerful centre-back Mohammed Awal (born 01.05.1988) who has signed for South African top level side Maritzburg United FC. Awal has been replaced with Kwabena Adusei (born 03.06.1986), the set-piece expert of Medeama SC who scored six goals least season. The strongman was a key player in the heart of the Medeama-defence. * Next season, a player from Uganda will for the first time in history feature in the GLO Premier League. Asante Kotoko FC has signed left-back Joseph Ochaya from Kampala City Council FC. Ochaya is a full international player for Uganda. * In July, MTN Football reported that Kotoko had signed defender David Smallboy Korbah and attacking midfielder Godfred Asante (born 24.07.1988) from Heart of Lions FC. * In July, SuperSport reported that Kotoko had signed striker Seidu Bansi (born 15.05.1990) from Ebusua Dwarfs. Bansi scored seven goals last season. According to the same article, Nurudeen Ali (born 16.05.1991), the left-winger or striker of Berekum Chelsea FC, is on the radar of Kotoko. Ali played for Aduana Stars FC on loan during the second part of the GLO Premier League 2011-2012, scoring two goals. * According to MTN Football, Kotoko has signed a couple of players from the lower leagues, namely striker Mohammed Touré from Bazooka FC, Musah Issa from Guan United FC and defender Nafiu Dramani from Cheetah FC. * I’m looking forward to see new signing Michael Helegbe (born 15.09.1985) in the Kotoko-shirt this season. Helegbe was the big star at Liberty Professionals FC before joining Kotoko towards the end of the GLO Premier League 2011-2012. * Ransford Osei (born 05.12.1990), the lively striker who seemed so promising a couple of years ago, is linked to Kotoko. Osei played for Bloemfontein Celtic in South Africa during the latter parts of the 2011-2012 ABSA Premiership. According to Ghanaweb, Kotoko is also interested in signing midfielder Seidu Salifu (born 02.08.1990) from Wa All Stars FC. Other players linked to Kotoko include goalkeeper Daniel Agyei (born 10.11.1989) from Liberty Professionals FC, striker Nana Poku (born 01.09.1988) from Berekum Chelsea FC, central defender Rashid Sumaila (born 18.12.1992) from Ebusua Dwarfs, left-winger Daniel Darkwah from Aduana Stars FC, defensive midfielder Yaw Alexander (born 06.01.1987) from Berekum Chelsea FC, attacking midfielder Issah Yakubu from Liberty Professionals FC and winger Richard Mpong (born 04.07.1990) from Medeama SC. * Central defender John Kuffour (born 15.01.1988), central midfielder Frank Boateng (born 17.08.1984) and defensive midfielder Afranie Yeboah (born 05.05.1988) were all fringe players at Kotoko last season. According to MTN Football, all three players have been released. I expect other clubs in Ghana to fight hard for their signatures as they are all quality players. Mohammed Yahaya (born 17.12.1988), the hard-working defensive midfielder / central defender, will mostly leave Kotoko and Hearts of Oak SC seems like a likely destination. Strikers Ben Acheampong (born 15.09.1990) and Ahmed Touré (born 17.07.1987) will almost certainly leave Kotoko. Acheampong is a trialist at Helsingborgs IF (Sweden) while the unsettled Touré has travelled back to the Ivory Coast, according to fresh reports. * AshGold will struggle hard to hold on to their key players, including goalkeeper Fatau Dauda (born 06.04.1985), talented central defender Lawrence Lartey and top striker Yakubu Mohammed (born 26.07.1990). Lartey was training with Espérance Sportive de Tunis earlier this summer. The picture is of Lartey and was found on melekher.com. * I guess the big concern of Arsenal fans is whether the club manages to hold on to captain and star defender Akwasi Acheampong (born 26.03.1991). * Chelsea is reportedly interested in elegant midfielder Daniel Nii Adjei (born 29.09.1988) from Asante Kotoko FC. * Bismark Idan (born 10.08.1989) will most likely play for Berekum Chelsea FC for the up-coming season. The sharp-shooting striker is a quality player at this level. Idan will possibly form a striking pair with new signing Latif Salifu (born 01.08.1990) from Liberty Professionals FC. * In central defender Rashid Sumaila (born 18.12.1992), Dwarfs has one of the hottest prospects in the league. Sumaila has been linked to most top clubs in Ghana but no move has yet to materialize. * According to MTN Football, Hearts of Oak SC has signed versatile defender Emmanuel Ansong (born 22.10.1989) from Aduana Stars FC. Ansong will most likely be found on the right-back or as a defensive midfielder. * Hearts of Oak SC has signed Seth Owusu (born 12.09.1990), the muscular, attacking-minded left-back from Medeama SC. Owusu was a very hyped player in 2010-2011 but has struggled to meet the expectations, partly because of injury worries. Last season, Owusu played only a handful of matches. * One of the biggest transfers so far this summer is the Phobian’s capture of Gilbert Fiamenyoh (born 06.07.1992) from Heart of Lions FC. Fiamenyoh, a burly striker who scored six goals last season, should be able to score regularly at his new club. * Hearts of Oak SC has been linked to midfielders Asiedu Attobrah and Sekyi Quaye (born 16.06.1990) of New Edubiase United FC, central defender John Ashong (born 02.11.1981) from AshantiGold SC, versatile defender Daniel Asamoah (born 01.04.1986) from AshantiGold SC, defensive midfielder Malik Akowuah (born 19.04.1990) from AshantiGold SC, striker Richard Addai (born 27.07.1986) from Bechem United FC and winger Tamimu Muntari of Mighty Jets FC. * According to SuperSport, four quality players are on their way out the door at Hearts of Oak SC, namely defensive midfielder Kofi Abanga (born 12.01.1988), central defender Kofi Agyare (born 19.02.1982), winger Douglas Nkrumah (born 28.11.1986) and striker Edwin Osei Pele (born 17.08.1988). According to Ghanasoccernet, defender Samuel Enzemoba (born 11.11.1987) has also been sent packing. * Attacking midfielder Uriah Asante (born 06.03.1992), who featured regularly for Hearts of Oak SC last season, has signed for Etoile du Sahel in Tunisia. * According to MTN Football, Liberty Professionals FC has signed striker Ebenezer Assifuah who featured for Eleven Wise FC at second level last season. Assifuah is currently part of the Ghana U-20 national football team. * According to Ghanasoccernet, Medeama SC has signed right-back Godfred Saka (born 02.11.1988) from Aduana Stars FC. Set-piece expert Saka was top scorer for Aduana Stars FC last season with six goals. * Mohammed Sabato (born 24.12.1989) played only a few matches for Asante Kotoko FC last season. The versatile defender will continue his career at Medeama SC. * Attacking midfielder Bismark Asiedu (born 17.09.1984) of Ebusua Dwarfs has been a popular man during the Ghanaian “silly season”. According to MTN Football, Asiedu signed a deal with Medeama SC earlier this month. * New Edubiase United FC has lost their star midfielder Abubakari Mumuni (born 17.05.1993) and star striker Emmanuel Baffour (born 02.04.1989) to South African top club Mamelodi Sundowns FC. Key midfielder Ibrahim Moro has travelled to Sweden and signed for AIK. The winners of the MTN FA Cup will desperately be needing to strenght their squad for the next season. * Moses Odjer and Francis Narh, two of the stars at Tema Youth FC, has lately performed well for the Ghana U-20 national football team. * Frank Sarfo Gyamfi, the speedy winger of Wa All Stars FC, joined Maritzburg United FC of South Africa in July. The youngster will be sorely missed in Wa.